One of our favorite parts of the Smart Kitchen Summit is our Startup Showcase. It's an opportunity for emerging businesses, makers, and entrepreneurs who are changing the meal journey to share their vision for the future of food and cooking. And we'll be bringing it to SKS Europe in Dublin this June! We announced the 8 finalists last week, and now we're launching a series of Q&A's so you can get to know these founders a little bit better. First up is Jeroen Spitaels, cofounder of Mealhero. This Belgian startup is essentially a frozen meal kit service with a connected countertop steamer. Read on to get to know Mealhero, then check back in to meet more contenders in our Startup Showcase! Note: This interview has been edited for grammar and clarity. Q: First thing’s first: give us your 15-second elevator pitch. A: Mealhero is a smart cooking solution for consumers who want to enjoy healthy meals with zero hassle. We bring together a smart cooking device, a food box filled with freshly frozen ingredients, and a smartphone application. Q: What inspired you to start Mealhero? A: My two co-founders, Steven and Anton, and I were on a holiday and we started complaining: we didn’t have the time or energy to cook a decent meal after a long day’s of work, and we were sick and tired of unhealthy alternatives. So one of us said: “Let’s build something that does all of the cooking for you." Things got rolling from there on. Q: What’s the most challenging part of getting a food tech startup off the ground? A: For us it is definitely finding the right combination of food and tech. We are lone rangers when it comes to the unique core of our concept in combining food hardware and software. So getting all of the puzzle pieces fitting perfectly and interacting with each other is definitely not as easy as it seems. Q: How will Mealhero change the day-to-day life of its users? A: Food — and especially healthy food — is something that, often, is the last thing we think about. Even though we all realize it is probably one of the most important aspects of our lives. We've all been in the situation when we have no idea how to get good, healthy food on the table. This is where Mealhero comes in. Because of the technology (both hardware and software), our Mealheroes are completely at ease of preparing a perfectly cooked meal. And because they're starting with frozen food (with a long shelf life), our community is able to plug and play Mealhero food into their schedule whenever they need it the most. Q: How does Mealhero use technology? A: Our technology is absolutely vital for our product. When we’re stressed out in the kitchen (due to lack of time or lack of chef-worthy skills) it's easy to mess up perfect ingredients. Too often we’re disappointed by the end result. Our technology takes this entire burden away. Our smart cooking device recognizes ingredients and cooks them to perfection, every single time. Q: How do you differentiate yourself from other prepared frozen meals and meal kits? A: Most food companies are focused on being either healthy or convenient. So we as consumers need to make a tough decision every day: Am I going to eat something healthy? Or am I going to eat something convenient? But there are very few services that bring the two together. So it’s exactly this market gap that Mealhero fills. With most frozen meals, the variety of choices is very, very limited. 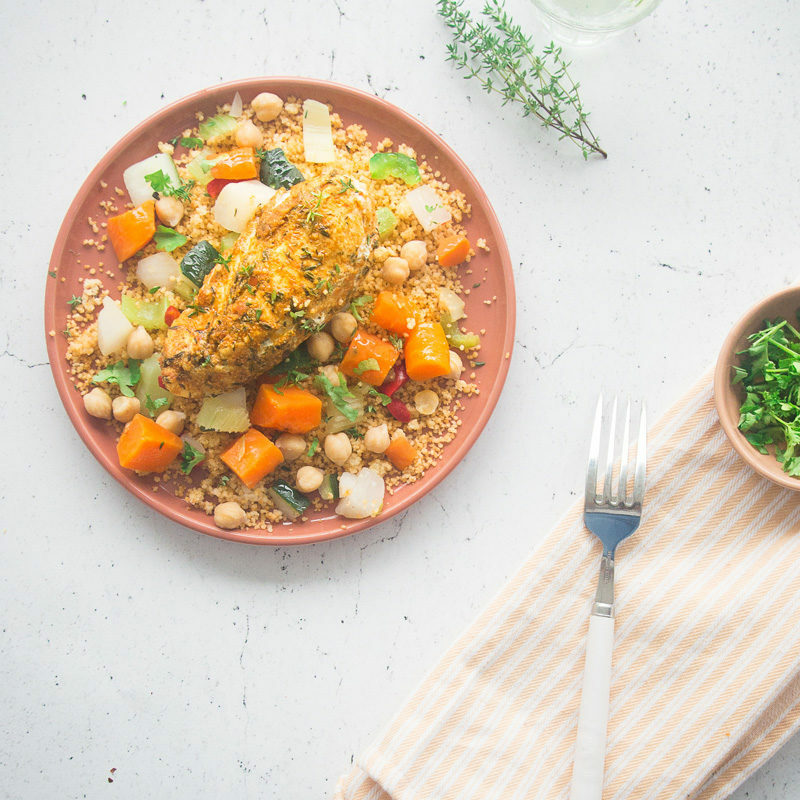 With Mealhero, you are able to choose from over 700 different meals. So we can perfectly tailor your meal to your specific needs. The problem with meal kits is that fresh food doesn’t always work well within a busy schedule. Because of the very short expiration date of 2 to 3 days, you need to adapt your entire week's schedule towards the meal kits, and there is very little margin for change. This often leads to food waste, which Mealhero does not since our ingredients are frozen. Q: What’s next for Mealhero? A: At this time, we’re about halfway towards reaching the delivery point for our Kickstarter backers. The first big milestone will definitely be delivering our product to our amazing Mealhero community so they can start preparing delicious home-cooked meals through our service. And afterwards, well: Bill Gates once said he wanted a computer in every home … Why not have a smart tech chef in every home to along with that? Want to hear from Jeroen and other emerging food tech entrepreneurs? Register for SKS Europe, this June 11-12 in the Guinness Storehouse in Dublin!